Scenic Foothills Community Council meets at 7 p.m. Thursday, December 4, at Wayland Baptist University, 7801 East 32nd Avenue (access via Old Muldoon Road off 36th Avenue). We will have a short but important meeting followed by a Holiday Season Social with cookies and apple cider. Please come! Click this newsletter link for more details. Your neighbors in East Anchorage have been working for years to create a Muldoon Town Square Park at the old Alaska Greenhouse site, Muldoon Road at DeBarr. On December 2, the Anchorage Assembly will hold a public hearing on the East Anchorage District Plan. The park is an important part of this plan. If you really are concerned about how we develop East Anchorage in future years and want to know that our problems will be addressed, please come to the Assembly chambers at Loussac Library at 6 p.m. Tuesday, December 2, and testify. 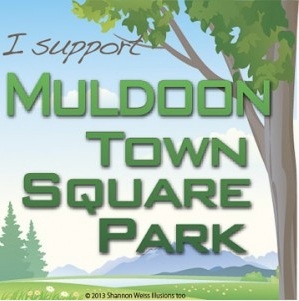 We hope you will also support a Muldoon Town Square Park. You can also e-mail all members of the Assembly at once at wwmas@muni.org as soon as possible – so they will have time to consider your comments before they meet December 2. Here are some talking points you can use: East Anchorage District Plan data shows East Anchorage has less park acreage per resident than other areas of Anchorage. This community park will bring us up to the livability standards of the rest of Anchorage. The Anchorage 2020 plan forecasts 11,000 new residents in East Anchorage. Many of our new neighbors will live in high density housing, without adequate lawns or green space. This park will provide open space and recreational opportunities for all. Having a park in this area will enable us to build an inviting gateway to Muldoon, giving the area much needed beautification. Muldoon already has sufficient commercial space, some of which stands empty. With this park we can break up the current monotony of commercial development. This park will give Muldoon a vital community gathering place. A park will highlight beautiful Chester Creek, providing area schools with educational opportunities about the importance of Anchorage’s waterways. On Tuesday evening, November 11th, Anchorage’s community councils are holding a “State of Our City” forum where eight local leaders will give their perspective on key issues facing our community and ways in which residents can become involved to create a better Anchorage. This year’s speakers include environmental advocate Nick Moe, arts advocate Bruce Farnsworth, civic hacker Brendan Babb, information advocate Mary Jo Torgeson, entrepreneur and property developer Ric Davidge, prisoner re-entry advocate Cathleen McLaughlin, business leader Andrew Halcro, and distinguished community leader Jane Angvik. The forum will be held at Wendler Middle School (2905 Lake Otis Parkway) and begin at 6:30 p.m., when each of the eight community leaders will speak for eight minutes each. It will be followed by a short question and answer period that finishes at 8 p.m. The forum is free to the public. Click here for a flyer about the event. The Municipality of Anchorage (MOA) Department of Public Works, Division of Project Management & Engineering (PM&E) has recently received funding to begin the design of Campbell Airstrip Road Upgrade and Trail Improvements, Tudor Road to Mile 0.7. Survey and geotechnical field crews will be working along the project corridor starting in early November and finishing by early December.